“Sitting in the audience, you are positively immersed in this old-timey and enchanting world of Dixieland jazz and bootleg gin, of broad pratfalls and vaudevillian slapstick comedy. This immersion is the wonderful thing about the show: after only a few minutes of admiring the quality of the music and snickering at the antics in the films, you’ll find that the two combine together seamlessly to make something greater than the component parts… To me, their music – its composition and its execution – is magnificent. It is by turns lyrical and exhilarating, and when paired with the hijinks onscreen, the 6-piece ensemble suits the note to the action, as it were, flawlessly. The Snark Ensemble is an instrumental group dedicated to the creation and live performance of new music to silent film. The ensemble joyfully celebrates the zany, clever, and brilliant world of vintage silent comedies in its specially-crafted film scores. Built around a core of three composer-performers (Andrew Earle Simpson, keyboards; Maurice Saylor, woodwinds; and Phil Carluzzo, percussion and frets), the Snark Ensemble creates and performs scores which respond to and amplify the events taking place on screen. To the composers of the Snark Ensemble, each film suggests a unique sound world. To this end, the multi-instrumental talents of the ensemble’s composers and guest performers allow them to draw on an astonishing range of instruments and stylistic diversity. The ensemble also creates and performs concert versions of their film scores and has supplied music for dance and incidental music for theater. Since its founding in 2005, the members of the Snark Ensemble have composed and premiered more than thirty silent film scores for DVD release and live performance. They recently recorded three of their scores for a forthcoming audio release on Naxos Records. Snark Ensemble scores are available on two DVD sets on the Allday Entertainment label: Lost and Found: the Harry Langdon Collection and the newly-released Becoming Charley Chase. You can see clips from the films and hear the complete scores on our Sounds & Sites page. The ensemble is named after Lewis Carroll’s epic nonsense poem The Hunting of the Snark: an Agony in Eight Fits. 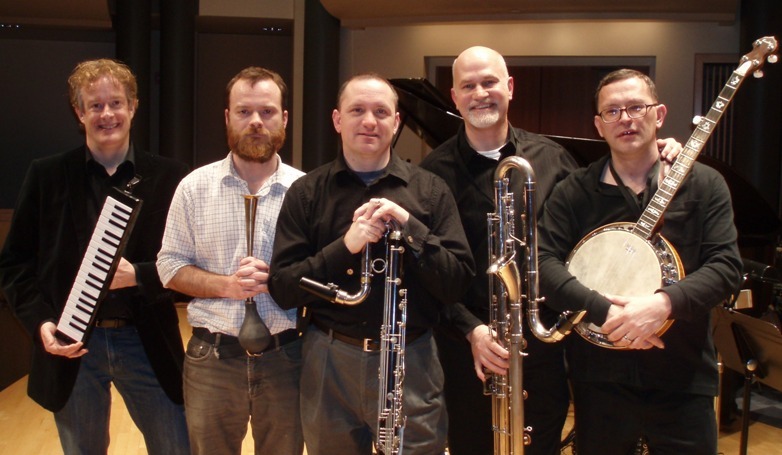 The Snark Ensemble with Ben Redwine & Dale Barton – our most frequent guest soloists.